My botanical name is Phoenix roebelenii but I am also known as Pygmy Date Palm. I have a dense head of delicate foliage with a slight arch. I am native to Southeast Asia but I was grown in Florida and am so happy to be going to my new home. 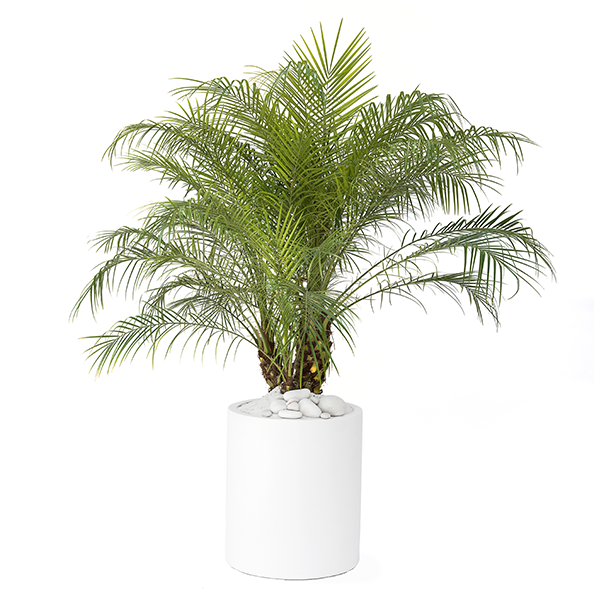 I can grow between 5-6 feet tall and will add beautiful full, green look to your home. Here are some care instructions and tips that will be useful as I get acclimated to my new home and grow with you for many years to come. My personality is delicate, tropical and light. I will grow tall and strong so make sure to put me in a location with plenty of space. You can also place me on terraces, balconies as I am resistant to the wind. You can place me in living rooms, hallways, bedrooms, offices, conference rooms, or anywhere with plenty of light. If you place me against walls such as room corners, rotate my container so all of the foliage gets even light. Check up on the same day of the week by inserting your finger into the soil about half an inch and feel the moisture level. If it feels moist, try again in a couple of days. If the soil feels dry, you need to water me as instructed above. I like moist but not soggy soil. Once we do this for a few weeks, you will get the hang of it and you can determine the best watering schedule for your light, temperature and moisture conditions. The leaves tend to face towards the ray of light , so good idea to rotate the plant occasionally. The air is too dry, to recreate the plant’s humid natural environment, mist the plant often.